We are a fully authorised distributor of Prysmian Bicon Cable Cleats for LSF and LSOH Cables. Also we distribute a complete range of Ellis Patents LSF Cable Cleats and LSOH Cable Cleats. In addition Ellis Patents are able to produce Cable Cleats to bespoke designs on request. Please contact us for more information or to discuss your specific requirements and our qualified team will be happy to help. 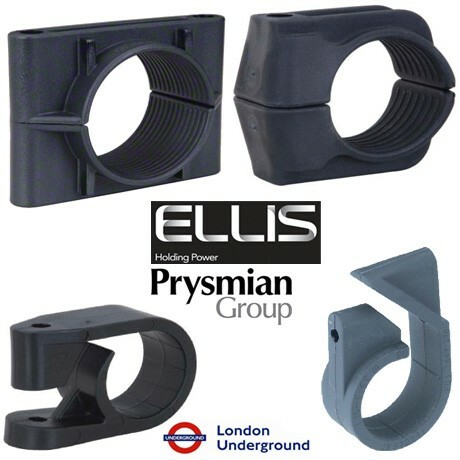 This comprehensive range of cable clamping solutions from Ellis Patents and the Prysmian Group (formerley Pirelli Cables, BICC, Bicon, Biccon) includes LSF Cleats for Trefoil Cables, LSF Single Cleats and Quad or Multi Cable Cleats. This range also includes a wide selection of Cable Cleats that have been tested and approved to London Underground (LUL) Specifications, a very high standard of Cable Cleat testing that is recognised throughout the industry. Ellis design and manufacture solutions for cabling environments globally. With 50 years of innovation and testing behind them, Ellis Patents are recognised as the world’s leading supplier of safety critical electrical cable cleats. Every day, vital operations and services such as the channel tunnel rail link, nuclear power plants and oil rigs rely on Ellis Patents Cable Cleats and associated products to keep them running safely. Prysmian Cables and Systems resulted from the aquisition and rebranding of the Pirelli Cables company; a major industry deal led by Goldman Sachs Capital Partners. Pirelli Cables were the major division of the Pirelli Group whose headquarters were in Milan, Italy. Pirelli carried out a number of strategic aquisitions during the period 1990/2000, and one of these included the Cables and Cable Accessories business of BICC (British Insulated Callender's Cables). BICC was responsible for the BICON range of Cable Accessories, which is Prysmian brand. Prysmian Cables and Systems was rebranded Prysmian Group following its acquisition of Draka Cables. Prysmian Group is largest cable manufacturing company in the world.